Can someone explain to Rep. Foxx the difference between hate crimes and hate speech laws? A wonderful conservative Congresswoman praises me for a position I never expressed. The House of Representatives today is debating a hate crimes bill which, among other things, would impose heightened penalties for crimes "motivated by prejudice based on the actual or perceived race, color, religion, national origin, gender, sexual orientation, gender identity, or disability of the victim." 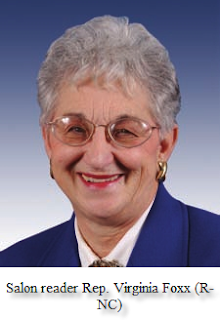 One of the GOP leaders opposing the bill on the House floor is Rep. Virginia Foxx of North Carolina, and -- bizarrely and rather amusingly -- she decided to feature something I wrote as a basis for her opposition to the bill. The two-minute audio of Rep. Foxx's doing this is here. She begins by announcing that "liberal commentator Glenn Greenwald, certainly no apologist for conservatives like myself, has some strong words for hate crimes bills." She goes on to state: "writing on Salon.com, he called hate crimes laws 'oppressive and pernicious'." She then explains that I "summarize[d] the consequences of this type of legislation very well," and proceeded to read at length from this post of mine from January, 2008, which, among other things, criticized Canada for formally investigating Ezra Levant and Mark Steyn for magazine items they published about Islam (the Mohammed cartoon and a column, respectively). When I began receiving emails earlier today informing me that Rep. Foxx had cited me as an eloquent and steadfast opponent of hate crimes laws, I was rather surprised, since I'm quite certain I've never before said or written a word about hate crimes laws. I was therefore confounded that I was being praised for my moving opposition to this bill. This blogger has solved the mystery. The post that Rep. Foxx is quoting is one which condemns hate speech laws. That is why its title is "The Noxious Fruits of Hate Speech laws." It has nothing to do with hate crimes legislation. Hate speech laws and hate crimes laws are entirely different, since the former punishes the pure expression of ideas while the latter involves the commission of actual crimes, usually quite violent and serious crimes. One can easily and coherently oppose the former but support the latter. I do actually harbor ambivalence about hate crimes laws, but find them far more justifiable than hate speech laws. The GOP floor leader opposing the bill should probably be aware of that distinction. I fully expect what I write to be radically distorted on the sort of right-wing blogs that support people like Rep. Foxx, but don't expect that to happen on the floor of the House, though, at this point, that is probably an unreasonable distinction to draw. (1) When Brian Ross' interview with John Kiriakou first aired in December, 2007, Columbia Journalism Review's Charles Kaiser emphatically criticized the report on the ground that Ross "never mentioned the existence of a diametrically opposite version of these events, or why he was so certain that Kiriakou was telling the truth" and that "Ross almost never challenged Kiriakou about anything." Kaiser thus concluded: "Those choices violated just about every journalistic standard of fairness and thoroughness that I can think of." As I documented yesterday, it was obvious at the time to real journalists that Ross' reporting merited extreme levels of doubt and skepticism; the New York Times exposé yesterday merely confirmed that long-known fact. Journalists like Ross don't do these things because they're unaware that their methods are likely to lead to the dissemination of inaccurate government propaganda; they're fully aware that's the case and they do it anyway -- because of that outcome, not despite it. (2) Tom Friedman and Garrison Keillor predictably join the virtually unanimous chorus of media voices who believe that government leaders (but not ordinary citizens) should be allowed to break the law with full impunity. At this point, these pro-immunity columns are so redundant that a software program (an extremely primitive one) could write them. Armando examines some of the depravity in Friedman's column, which excuses torture more overtly than most of its kind are willing to do. I was wondering if someone could answer this question: we have a large number of criminal laws that purport to restrict what political leaders are allowed to do. What is the point of having those laws? I'd genuinely be interested in hearing an answer to that question, because -- in light of the elite consensus that prosecutions for government leaders are too divisive, vengeful and distracting to pursue -- I honestly don't know the answer to that question. UPDATE: I wish all those super-annoying torture victims would stop trying to divide us and distract us from all the Important Things we have to do with their self-absorbed, past-obsessed, vengeful cries for justice. Similarly, Spanish authorities continue with their petty, distracting chatter about "the rule of law" and "the Geneva Conventions" and "treaty obligations" by opening a new criminal investigation into Bush's torture regime. What kind of strange and vindictive country actually takes seriously the idea that officials who systematically order torture should be held accountable for what they did -- all because so-called "treaties" and "laws" require that? Finally, in comments, BriGuy3o1 provides as good an answer as any -- probably the right one -- to my question about why we bother to have "criminal laws that purport to restrict what political leaders are allowed to do." His answer: "To purport." UPDATE II: Pam Spaulding writes about a much more notable comment from Rep. Foxx as part of her speech today. UPDATE III: This morning, I was on CBC Radio in Canada debating drug decriminalization, along with a Portuguese drug official and a Canadian official who strongly advocates criminalization. The debate was quite good; those interested can listen to it here (scroll down to Part 3).